Serve this flavorful stew by itself or over rice or potatoes. In a large skillet cook onion, mushrooms and celery in 1/2 cup of the water for 10 minutes. Add garlic, chili powder, cumin and black pepper and cook one minute longer. Mix in lentils, bay leaf and 1 1/2 cups water and simmer covered for 30 minutes. Add tomatoes and kidney beans. Cook about 15 minutes or until lentils are tender. Remove bay leaf. Stir in nondairy milk. In pressure cooker, saute' onion, mushrooms, celery in 2 Tablespoons of water for 10 minutes. Add 2 more Tablespoons of water, 2 minced cloves of garlic, 1 Tablespoon chili powder, 2 teaspoons cumin and 1 teaspoon turmeric and cook one minute longer. 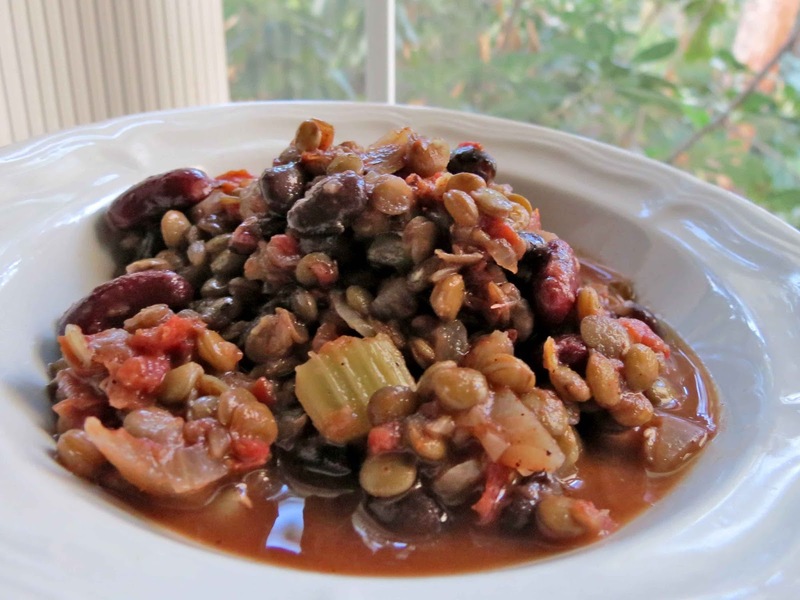 Mix in one cup of uncooked lentils, 1/2 cup uncooked brown rice, 2 3/4 cups water, tomatoes and bay leaf. Cook under pressure for 10 minutes and allow pressure to release naturally. Remove bay leaf, stir in kidney beans, milk and 1/4 teaspoon or more of ground black pepper.